The Kingston Trio had a tremendous influence in bringing folk music into the mainstream of popular music in the late 1950’s and 1960’s. Since that exciting time when they had many hits, such as Tom Dooley, Where Have all the Flowers Gone?, A Woried Man, and many, many more, this music has inspired many and remains a part of our culture. The group carries on with Josh Reynolds, son of original founding member Nick Reynolds, joined by two of Nick’s closest kindred spirits, Mike Marvin, Nick’s nephew and Tim Gorelangton, Mike’s musical brother. 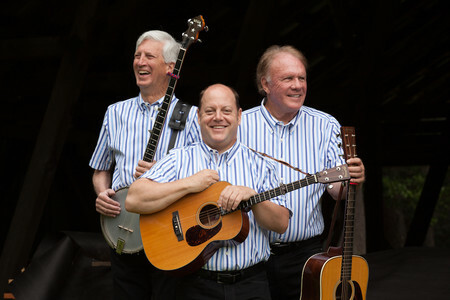 The three have re-captured that original Kingston Trio magic with their energy, humor and crowd charming musical repertoire. Join us for this great show in Beckman Auditorium (Big Beckman)! Ticket prices are $45, $40, $35; $10 youth; Caltech/JPL discounts available. Mention the Pasadena Folk Music Society when you order the tickets in advance or buy them at the door, and you’ll received a $5 discount. Call the Caltech Ticket Office at (626) 395-4652 and visit their web page for more information about the show. The Pasadena Folk Music Society is a marketing partner for this show and we wholly endorse it!